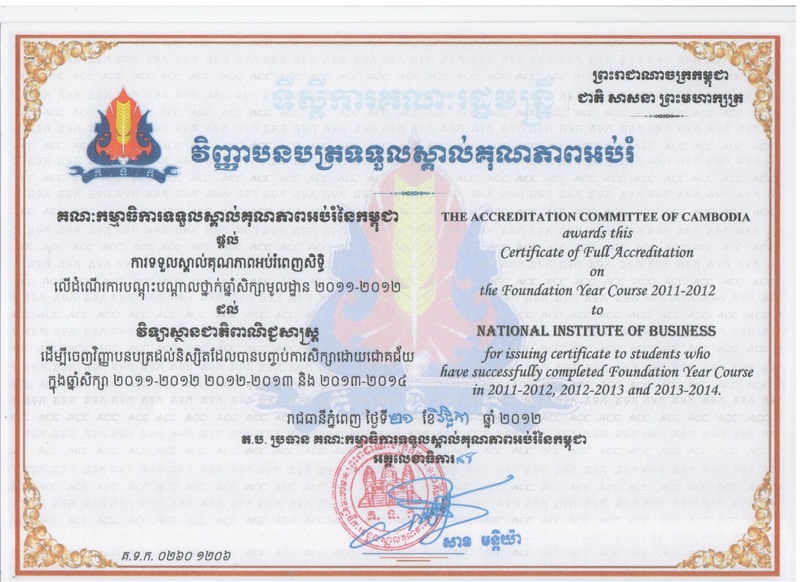 National Institute of Business was established in 1979 after the country was liberated from the ashes of the Pol Pot Genocide Regime. The institute's location is located in the campus of French secondary School during early stages of its activities, the institute known as "Central Commercial Technique School" equivalent to a department under the direct management of the Ministry of Commerce. Then, the school trained carders, staff in the field of trade and carders and staff in other units involved in the goods trafficking and distribution sectors. Until 1985, the Council of Ministers issued a decision to change from the Central Commercial Technique School to Commercial Specialize Faculty Department to of Commerce with equal rank to Provincial/Municipal Department and provided secondary commercial specialize training for civil servants and general education students from secondary education level 1. The course took 3 years that one year for supplementary foundation knowledge and two years for professional skill training. Subjects which were trained including trade business, accounting, planning, statistics, foreign trade, equipment. In 1994, the Specialized Business School was transferred from the administration of the Ministry of Commerce to be directly administered by the Ministry of Education, Youth and Sport. Based on the school's qualifications and in accordance with the policy of globalization in 2001, Royal Government promoted and transformed this school to be a higher education institution under the sub-decree No. 108 ANKR.BK dated 24 October 2001 under the name as "NATIONAL INSTITUTE OF BUSINESS". 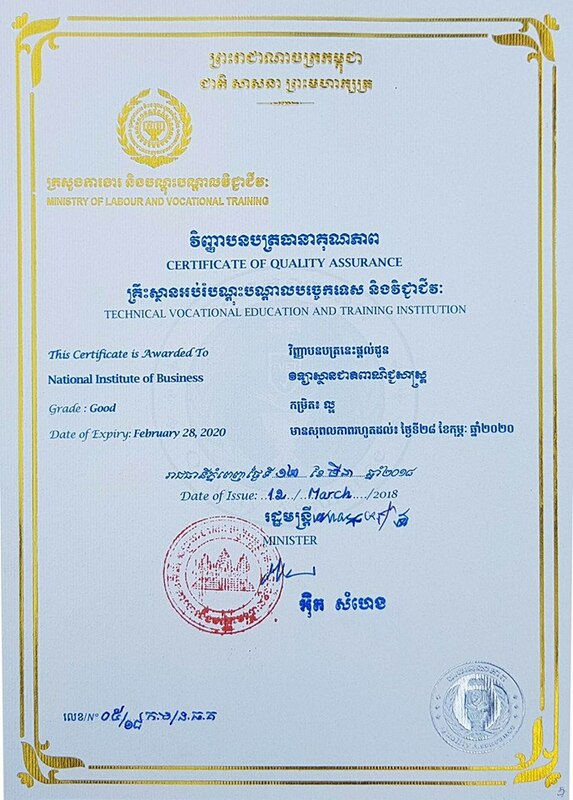 In 2004, the National Institute of Business was transferred to the Ministry of Labor and Vocational Training under Sub-decree No 37, ANKR.BK dated 16 August 2004. 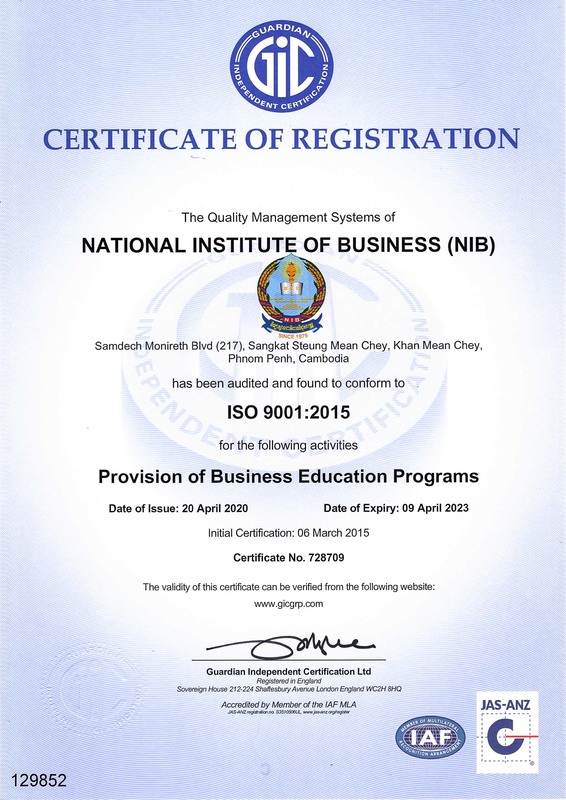 National Institute of Business is accredited by Accreditation Committee of Cambodia and the International Standard Organization (ISO 9001: 2008) and currently, National Institute of Business has been fulfilling its roles and responsibilities actively in providing education and training in accounting and finance, banking and finance, business administration, sales and marketing, international relations, international business administration, information technology, English language and so on for Technical and Vocational Degree, Associate Degree, Bachelor Degree and Master Degree. As a result, the Institute has trained quality human resources and be able to meet the needs of the domestic and foreign labor market. A leading educational institution providing scholarship opportunities for learners the careers, jobs and success in businesses. Raising awareness on national culture, and contributing in community development. Educate and train students be qualified, have job and earn high incomes.